I was wondering if there were some gardening crafts that you have completed with success ! I have tried several, some were flops after a season outdoors some are still performing. I have made several kinds of chimes,decorated bought mini birdhouses & made chimes out of a few. 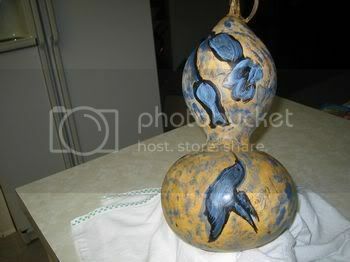 Stepping stones of many kinds and now I have these birdhouse gourds. 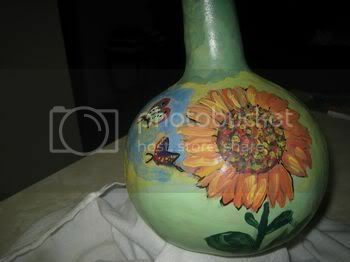 I do not have a painters hand I tried painting Terra cotta pots and disliked them greatly! I can use a little help here.These birdhouse gourds I grew at a friends plot, I didn't have room for them at home. I have worked with them from June then harvested them in September they have been a long dragged out chore but now they that survived the mildew and rot with many hours of work cleaning and smelling the laundry room; they are ready for sanding and painting! I was going to make Birdhouses but dont have a good place to hang so my thoughts are frog and toad houses! Has anyone grown and completed this task? Here they are I started out with about 20+ here is the end result.Not sure if my friends still have theirs. And show us your Gardening projects! I grew a ton of luffas last year and dried them. It was great they were not the ones like in the store that have been all beefed up on chemical fertilizers, these were organic. I did not have to bleach them , when they peeld they were snow white and so soft. I gave them as Christmas Gifts this year and everyone loves them. I also grew gourds and dried and painted them. I did bird houses and added my own touches depending on who they were going to. I grew the herbs to make homemade vinggars and bottled it in cool bottles I found. Other than that this year that has been it. Luffas?? is that in the cucumber family? A vine...? How long before harvest,our season was too short so I had hours of work and communication to keep them from rotting.. How did you store them? Did you let them get as big as these that I grew at a friends? Did you have a mildew and mold problem like I did ?OH>>Did you hear seed rattling inside? Since my back went caput, I tend to do everything, even crafts, in very small steps. i did have pictures along the way -- but in October my computer went caput as well as ALL OF MY PHOTOS. Talk about crying like a baby. Hubby had a few pictures on his computer, so I can share a bit. I've been in pain for so very long, it will be some time before I can even start something new, tho I do keep in prayer and am hopefull for the New Year. Yeah yeah, stop rambling Scarez, get on with the pics. 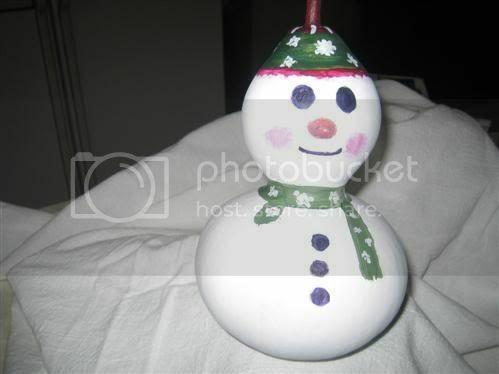 Scarez, I decorated several $1store birdhouses,they didn't like the out doors.I also made a chime or 2 with them.Yours of course was done with talent..mine,well, looked like a 5yrold did it, cute but not not good for a gift. Why are you in pain? Are you referring to the loss of the pictures? I know how that feels,and hope that is what you speak of.Or...did I miss something? thanks for the compliment doll. I appreciate all the good kudos I can get! Body pain Kale. Apparently i have (doctors words) severe osteo-arthritis (oh joy) with severe Fibromyalgia (but I'm supposedly NOT supposed to tell Soc. Sec. that part (?) no clue why) along with paralysis and good golly who knows what else eh? Kind of a mishmosh of "the ole gray mare she ain't what she used to be". Even sitting at the computer causes my arms and hands to go numb, so I take a break and come back, then take a break, come back.... gawd. Now I've got some extreme breast pains, so they're sending me for a lovely mammo on friday. Oh I'm so looking forward to that process...........kill me now. This being in pain constantly is affecting more than just me -- the ripple effect on my family is pretty dire. I fall, a lot, and they freak out more than me, but then again, they have their own "issues". They help me put on my socks n' shoes while I just die of embarrassment, but we'll get through this if it's God's will. The loss of my computer was like icing on the cake really. All my medical info on there, all my family photos, all my employment records -- you name it...all my gardening photos, much less my garden journal since 2002 -- gone, zip, zero, history, naddah. I am still finding out just how much I've lost. Hi I have neuropathy and it's treated a lot like fibromyalgia. Mine is treated with Lyrica and it does help the numbness and the dropping of stuff. I have arthritis in my knees and I take Osteo Tri-Plex. If that doesn't cut the pain I use Tylenol Arthiritis. Life ain't what it used to be. Never had these problems until I went through chemo 9 years ago for ovarian cancer. But I am still a kicking. I'm so sorry your in so much pain Scarez. Hopefully you'll get some relief soon. I'm don't know what SS has to do with it. Are you applying for disability, if you are I would think that would help you a lot. I know what it means to lose everything you have on your computer because I lost everything a few months ago to. I took mine to the shop and they were able to reterive all my pictures (some I had forgotten about having) and other info I had on there and only charged me $20.00. Maybe you can call around to some repair shops ask about it. It was well worth the 20 bucks to me. Kale, YOU ARE NOT ALONE!! LOL!!!!!!! All my "crafty" stuff ends up looking like kindergarten rejects! Makes me feel like such a failure when I see some of the really cool stuff some of our pals make & show! Usually end up trying to trade other stuff for some of their cool handmade stuff! Just have to concentrate on the things I "am" good at. Like making folks laugh - I'm good at that - (intended or not), sharing, giving, writing and other little things, but I couldn't paint anything more creative than the side of a barn! LOL! You ought to have seen the results when I tried sculpting from clay once. An ashtray would have been a "nice" thing to call it. LOL!! Scarez, "this too shall pass" - hang in there! And will sure add you to my list asking for healing. I'm with Randy on backing stuff up - esp pics! Most of my pics are on the computer now. Scanned everything at some point and eventually got it done. Now, it's backup-backup-backup! If there's any way to retrieve any of your data, get it done - its worth $$! Maybe some of the crafty folks here will start posting ideas to share with others. One thing I do is take cheap plastic pots and paint with a dark stain on the pots. I spray a clear sealer on the pots to help keep the stain on. Sure makes them look like anything but a cheap plastic pot. The terra cotta colored ones look the best in my opinion. But now, I'm thinking....what do I do with them? So far, I've just used them in a seasonal display, or one with a certain color scheme. As a piece of "art" in and of itself, they aren't! 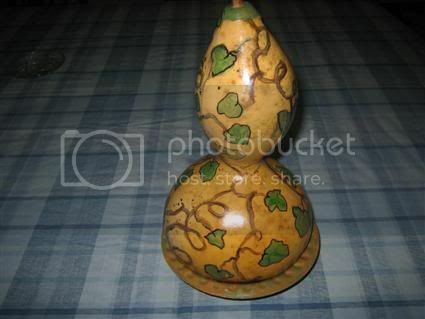 In the future I hope to do some wood burned designs and finish the gourd in its natural color. I'm also growing different varieties this year, so I have a lot to look forward to. OMG, Maw those are AWESOME!! Well done girl, really!! So, do you sell them? If you need help selling them, I have a few awesome auction sites you might enjoy being part of. Oh, and I've just gotten some "Donna Dewberry" books - hoping my body and painting can become "friends". Maw, your gourds have NOTHING in common with the kindergarten results I am talking about! LOL!!!!!!!!!!!!! Your stuff looks just GREAT! oooo!!! 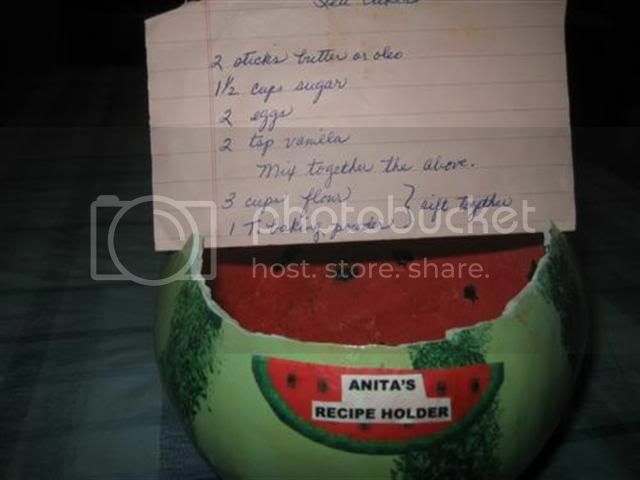 You gotta show them the cool watermelon bowl!!!!!! Dizzy Daff.Yes, you and me..side of a barn..
How long for them to mature and were they fun to work with? I ended up with 5 everyone let theirs rot to the garbage! 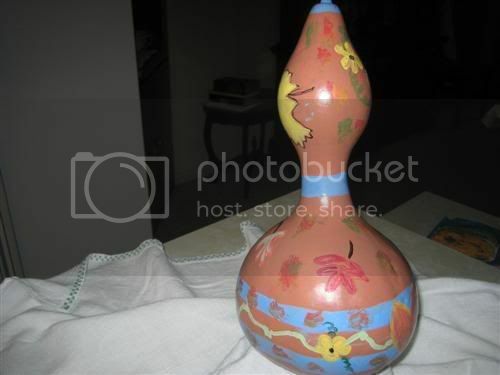 I am trying to make a deal with someone so they will paint my gourds. I know for certain I will mess them up and months of watching and tending and cleaning them will go down the drain. OH No way! that was too good !!! "Maw, your gourds have NOTHING in common with the kindergarten results I am talking about! LOL!!!!!!!!!!!!! Scarez....Your mosiac bird house is adoreable! I know the little girl you gave it to was just tickled pink! And, thanks to all for the compliments! I've given several gourds away, but still have three just sittin' here! Hmmm maybe I will let you put them on your auction site. That sounds exciting, and would get me really revved up to do more painting! 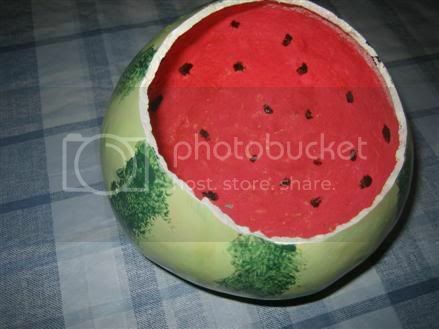 Here's the watermelon bowl dizzydaff was talking about. It's the bottom part of a gourd I accidentally broke the top off of. I made a slit on each side of the rim so it can be used for a recipe holder. I gave this as a gift, too. It's weighted with red candy, because the gourd is extremely light weight. This one is special to me because it features the Scottish Thistle, and I'm of Scots descent. The top was cut off to make either a vase, or a pencil holder. Kale, I have painted the plastic pots as well but I still like the special walnut stain I think it's from MinWax. I helped a grower/nursery owner last year and did some pots for her several ways. The stained ones always sold first. I put the stain going the long way and it looked a lot like a wood container when I finished with it.